At its annual conference in Naples, the International Association for Vegetation Science elected Professor John Rodwell, Director of Lancaster's Unit of Vegetation Science, Vice-President. At the meeting, attended by over 200 delegates from 34 countries, Professor Rodwell presented the newly-published Diversity of European Vegetation, the first ever overview of the plant communities of the Continent. Produced by an international team of ecologists, in which the Unit represented the UK and among whom he was chief editor, this book has already been warmly welcomed by the European Environment Agency as a key tool for administering EU nature protection policy. Within the new Lancaster Environment Centre, along with partners from The Netherlands, Italy, Germany, the Czech Republic and Siberia, Professor Rodwell will now be pioneering the development of SynBioSys, a web-based information system linking data on the biodiversity of plant species, vegetation types and landscapes across Europe. 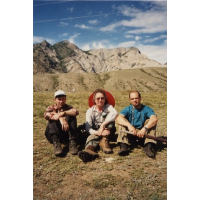 (See Photo) - Professor Rodwell working in the Southern Siberian steppes with Professor Ayzik Solomeshch and Dr Nikolai Ermakov of the Russian Academy of Sciences.